What Did The Fox Say? Science! 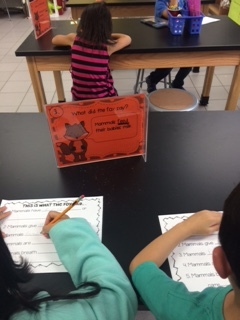 Each year, we start our first graders off by learning about animals with a vertebrate. I make a fun pack last year that I am using for my assessment. You can find it here: Animal Classifications Pack. This year, I wanted to add a way for my students to walk around the room (now that I have a REAL classroom!!!!) to locate information that would help them remember what makes a mammal a mammal. Every year I read the book Is A Cammal A Mammal?. This book gives a multitude of mammal expamples and it is in the Cat In The Hat's Learning Library. When we are finished, this year we reviewed with a smartboard review followed up by a quick circle the mammal activity! It got the students making the connections that they needed to make and it added a bit of an assessment. I will bu using those sheets to call up each student individually next week as they work on BAT Stations! Stay tuned! With our littles, I love to add music, art, writing, reading, and science! What a great way to find time to add science into your day! Check out the What Does The Fox Say Stations in Action! My firsties are moving from station to station on a Fox Hunt! They are looking for the missing word to fill in the blank. They work alone or with partners...I even underline the magic word for them to match the number on the station to the number on the sheet! What does the Fox say? 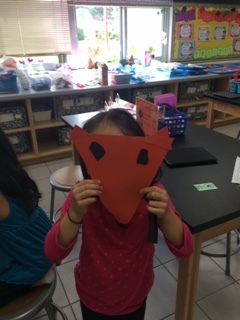 I use the 5 characteristics that we learned about for their writing activity connection and the real fox helps them out! 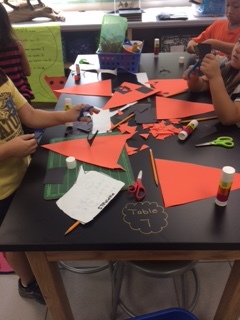 When they are all through, they work on a simple art activity! What does this fox say? 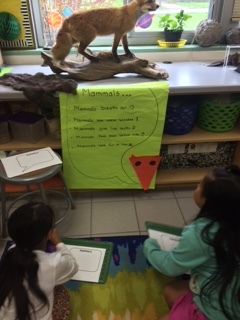 I learned about what makes a mammal a mammal! You can find these mammal stations here: Mammal Stations: What Did the Fox Say?